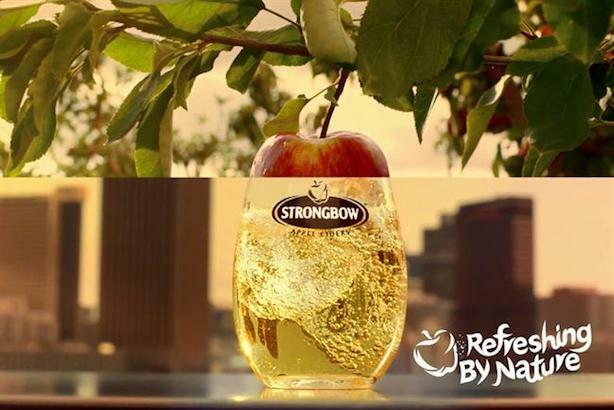 It's a big brand in the U.K., but in its new global campaign, Strongbow is facing the challenge of talking to people in countries where cider barely exists. The campaign, Refresh and Connect, will break on Monday in an initial eight markets, but Sharon Walsh, global director of cider at Heineken, said it will later run in at least 25 markets. The campaign include TV, mobile video, cinema, and outdoor, with the creatives across all media using a "split screen" visual device that puts images of apples and orchards alongside shots of friends enjoying drinks together. Heineken divides cider markets into four tiers, she said, each of which has its own challenges. Established markets, where people already "have cider in their routine," tend to be those with the most British cultural influence – including Canada, South Africa, and the Nordic nations. Then there’s what they call "young cider markets," where the drink is becoming known but is less embedded. These include several European countries, as well as the U.S. The third is "white space markets," where cider has effectively no presence – these include Mexico, Nigeria, and Vietnam. Vietnam presents a "perfect opportunity" to popularize the brand, Walsh said, because 80% to 90% of alcohol sold there is beer, but people in Vietnam love sweet drinks and often drink their beer over ice. The fourth category is "old world cider" markets, including France, Spain, and Argentina, where cider is quite a different drink to the English style, tends to be sold in large bottles and drunk seasonally, and so presents a different set of marketing challenges. "In new markets, the risk is that it becomes seen as an alcopop," she said. "So it’s really important that we talk about ‘romancing the apple.' Orchards and nature play a big role in that." Like last year’s Heineken campaign, Open Your World, the Strongbow campaign is informed by the role that cities increasingly play in the lives of the world’s urban population. But while that campaign was about using the city as a launchpad for adventure, this one is more about offering escape. "Strongbow has always been focused on nature and on urban and city lives," Walsh said. The 2016 campaign Nature Remix played with the idea of the natural world reclaiming space in urban environments. "There’s a real insight behind that – urbanites, people living in the city, are so caught up with the pace in the city that you often need to leave to reconnect," she added. "We wanted to go back to real times and basic times – a real rural feel we can bring to the city to help people refresh themselves." For the mobile executions of the campaign, Strongbow worked with the Facebook Creative Shop global team in Amsterdam, a partnership Walsh said came out of a previous collaboration between Heineken U.K. and the London Facebook Creative Shop team on Birra Moretti. "We brought Facebook in to get some advice on what works," she said. "We don’t have all the money in the world. We’re a small category and need to make sure our spend is efficient. We used the Moretti thing as our inspiration to come in early – the U.K. team did a phenomenal job." Although Heineken has a loose aspiration for 50% of its media spend globally to go on digital by 2020, up from around 30% now, Walsh said TV remained vital. "When you’re building a completely new category, the TV spot plays a big role," she said.